The Fastime 7 Stopwatch has a rugged water resistant and shock resistant case. With a 1 year warranty. Stopwatch, Repeating Countdown/up timer, Pacer, Alarm and time, day date display. 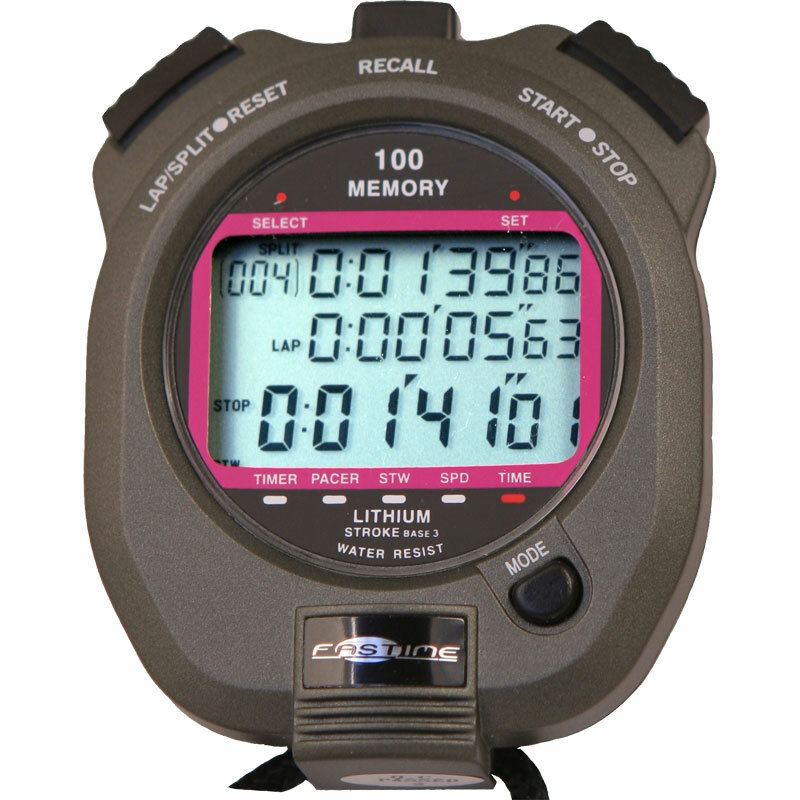 Stopwatch: Measures up to 9hrs 59mins 59 secs 99/100ths sec. Triple display shows: Cumulative and Lap split time to the last split. Cumulative running time. 100 cumulative and split times can be stored in memory with fastest, slowest and times identified. Time out (start, stop, resume) function is also included. Repeating Countdown/up Timer: Maximum setting 9hr 59min 59sec Display shows TARGET TIME, and COUNTING DOWN TIME. Alarm sounds at the end of each countdown / up. When set to countdown/up option, the timer counts down from the preset target time o zero, then counts up in 1/100th second until stopped. Option to START, STOP and RESTART the countdown/up are available. I certificate these for Cycling Time trails. Excellent watch for all but the biggest of open events. Newitts are always prompt with delivery and ample packaging. the stopwatch is good with clear digits. Even with instructions I am struggling to set correctly other features. Recomended if you have the need for many splits and elaped time.